In memory of Provost Professor Roy Gardner, a cherished colleague and teacher, the Institute for European Studies has established an annual Roy Gardner Best Master’s Thesis Award. Professor Gardner sat on more EURO thesis committees than any other faculty member in EURO history, and was an integral and active member of the Institute for European Studies faculty and community. The prize for this award is currently $200. Faculty are asked to nominate students they have worked with for consideration. 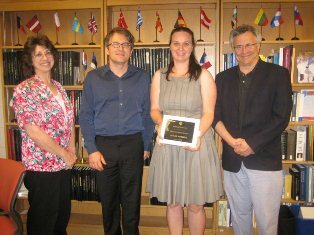 The 2012-13 recipient of the Gardner Award was Sonja Rother, who defended a thesis titled "'I Think I Should Like to Die Here': Proust, Mann and James in Venice" in spring 2012. Her thesis was directed by Professors David Hertz, Johannes Türk, and Loise Wise. A well-known academic, Professor Gardner specialized in game theory and worked in fields as diverse as European integration, post Soviet economies, environmental economics, and many others. He was on the editorial board of a number of academic journals, and was academic director of the MA program in economics at the Ukranian National University. Despite being an in-demand academic with a busy international schedule, Dr. Gardner was always available to students and was willing and eager to assist whenever he could.